The upper image above shows a 3 color image of the sky with RED=3.5 microns, GREEN=2.2 microns and BLUE=1.25 microns. 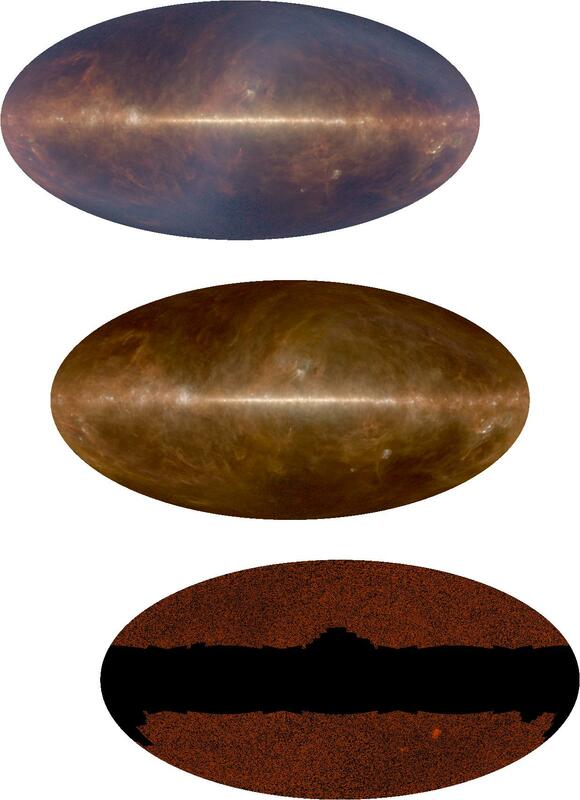 The middle image is the same with the zodiacal foreground subtracted out. The lower image is the CIRB after the galactic foreground has been subtracted out using the Dwek & Arendt (1998, ApJL, 508, L9) technique of subtracting a fraction of the 2.2 micron image from the 3.5 micron image. This subtraction is unreliable near the Galactic plane, so this area has been masked out. All of the images use 4 decade logarithmic color scales. The lowest level is 3.95 kJy/sr at 3.5 microns, 6.67 kJy/sr at 2.2 microns, and 7.08 kJy/sr at 1.25 microns for the upper and middle images, but 0.395 kJy/sr for the lower image. Click on the image to get a much larger image [205 kB] at the full DIRBE resolution. 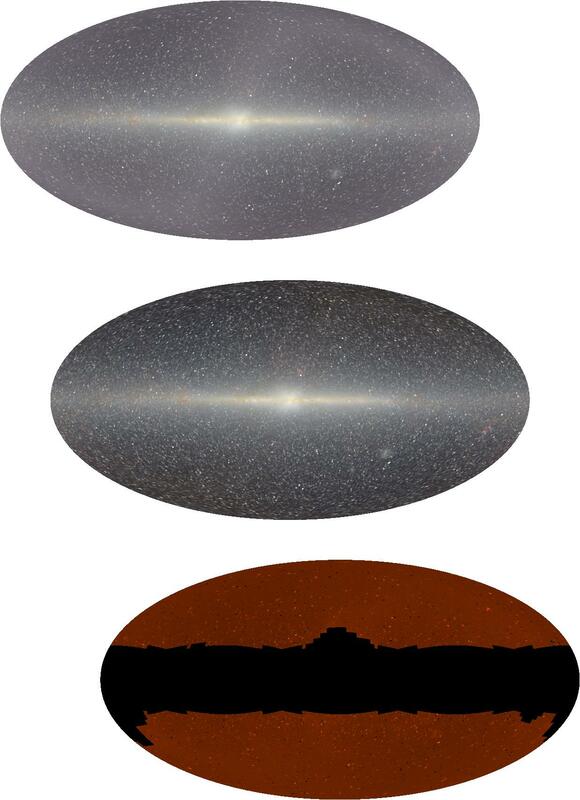 The upper image above shows a 3 color image of the sky with RED=240 microns, GREEN=100 microns and BLUE=60 microns. The middle image is the same with the zodiacal foreground subtracted out. The lower image is the CIRB after the galactic foreground has been subtracted out using the Arendt et al. (1998, ApJ, 508, 74-105) ISM2 technique of subtracting multiples of the 100 micron and 140 micron images from the 240 micron image. All of the images use 4 decade logarithmic color scales. The lowest level is 223.2 kJy/sr at 240 microns, 555.3 kJy/sr at 100 microns, and 508.2 kJy/sr at 60 microns for the upper and middle images, but 30.7 kJy/sr for the lower image. Click on the image to get a much larger image [229 kB] at the full DIRBE resolution. The lower panels in both images are designed to have the same mean level and contrast in the false color rendition. But the far infrared CIRB image is many times noisier than the near IR CIRB image, and thus the two panels have different appearances.